If you’re thinking of getting the best backpack vacuum, I’m here to help. Backpack vacuums are typically designed for commercial use. In recent times, however, backpack vacuums are no longer exclusive to businesses— you can easily order one online and have it delivered to your home. To spare you the agony of browsing through countless backpack vacuum reviews, I have summed up the top 5 best backpack vacuum cleaner with full reviews. Here's the quick top list for the best backpack vacuum you can easily invest and use. SHOULD YOU GET A BACKPACK VACUUM? This is probably the first question you should ask before making a backpack vacuum purchase. For a start, you might want to learn about the pros and cons that come with a backpack vacuum. You can stand upright most of the time when using a backpack vacuum. With a canister or an upright vacuum cleaner, you may find yourself having to hunch frequently to push or drag the cleaner. Backpack vacuums tend to be lighter than canister or upright vacuums. They are also great for areas that require a higher reach, such as ceiling fans. Because backpack vacuums tend to be lightweight and compact, they make for easier navigation around obstacles, staircases and tight corners. The lightweight and compact design of most backpack vacuums also make for convenient storage. If your apartment is tiny with limited storage space, a backpack vacuum may be an ideal choice of vacuum cleaner for you. As mentioned, most backpack vacuums are designed for commercial use. A backpack vacuum typically has higher suction power and better performance when compared to conventional vacuums which are designed for home use. In short, a backpack vacuum would be able to clean better and faster. On average, backpack vacuums cost more than the conventional upright or canister vacuums. Whereas you can probably find a decent upright or canister vacuum for less than $100, the cheapest backpack vacuum on my list costs slightly above $140. Most backpack vacuums cost more than $200 and the higher-end backpack vacuums can go up to $1,000 and more. Most backpack vacuums are designed for more efficient and effective industrial cleaning. Consequently, they may not come with fancy features that some upright vacuums have when it comes to things like brush customization for seamless cleaning transition between different floor types, clean filter indicators, headlights, pet turbo brush tools, etc. If you are buying a vacuum cleaner for home use, this may be an important consideration that you should factor into your decision. If you decide that a backpack vacuum is the way to go, here are some tips to help you make an informed choice. Backpack vacuums with stronger suction power will be able to do a more thorough and faster job at cleaning. Don’t be confused by the many specifications listed. Things like watts and amperes provide useful indications of a backpack vacuum’s suction power, but more importantly, you should be looking at the vacuum’s airflow measured in cubic feet per minute (CFM) where available. Unhampered airflow ensures that the backpack vacuum has strong suction power. You will be carrying the backpack vacuum on your back for prolonged periods of time on a regular basis. Therefore, it is important that you take the weight of the backpack vacuum into consideration. You don’t want to end up hurting your back with a vacuum that is too heavy for you! Most backpack vacuums are designed for commercial use, so they typically come with long power cords. A long power cord is a useful feature to consider when deciding which backpack vacuum provides better value for your buck. However, it needn’t be a deal-breaker— an extension cord will easily do the trick to provide the extra maneuverability when it comes to cleaning large spaces. Is the design of the backpack vacuum body-friendly? Besides the weight of the backpack vacuum, the harness and straps are also important features that you should consider. Look for backpack vacuums with adjustable straps and harnesses (preferably well-padded for that extra comfort) that are designed to distribute the weight of the vacuum evenly around your center of gravity. If you are making the purchase online, pay close attention to the backpack vacuum reviews from customers or post a question to the seller so that you have a better idea of the harness and strap design. What are the features and tools that come with the vacuum? As with any other vacuum cleaner, consider a backpack vacuum that comes with a tool kit so that you don’t have to purchase the tools separately. A backpack vacuum that uses the HEPA-certified filter also gives you the assurance of an allergen-free environment. The Hoover C2401 is my top choice for the best overall backpack vacuum. At 9.2lbs, it is the lightest backpack vacuum of the list without compromising on its suction power. It is powered by an 8.5-ampere motor and can provide up to 120 CFM of airflow and 102 inches of water lift. Other great features include its touted chiropractor-designed harness, a 48-feet power cord, a good array of tools and accessories, and HEPA filtration technology. At just very affordable price, the Hoover C2401 is comparable to that of mid- to high-end upright vacuums with the added advantages of higher suction power and a lightweight design. However, this backpack vacuum has few weakness. Compared to the Atrix VACBP1, the Hoover C2401 seems to have fewer customer complaints around its lack of durability. For a mid-ranged product, the Hoover C2401 hits the jackpot as an all-rounder in terms of its cleaning powers, durability, price and lightweight design. Last but not least, we have the ProTeam ProVac FS 6. I usually try not to recommend the same brand more than once, but this backpack vacuum really surpasses its competition and deserves to be mentioned. 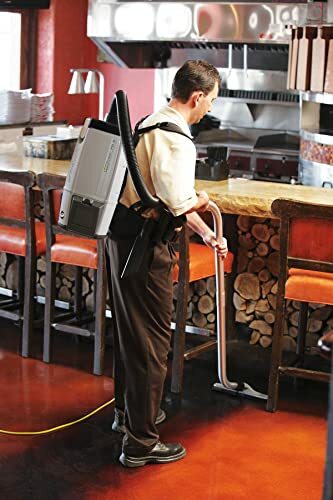 Designed specifically for the residential cleaning industry, this backpack vacuum is a multi-tasker at cleaning frequently used high traffic areas, above-floor areas that are hard to reach, as well as areas with many obstacles like furniture and fixtures. With up to 159 CFM of airflow and 96 inches of water lift, the ProTeam ProVac FS 6 is just a few notches below the ProTeam Super CoachVac in terms of its suction power. It also comes with various features that are largely similar to the ProTeam Super CoachVac. At 11.6lbs, this backpack vacuum is slightly heavier but still manageable for regular use. Interesting tools include an all-purpose claw nozzle for upholstery and carpets, a turbo brush that is suitable for both low-pile and high-pile carpets, as well as a hard floor tool specifically made to pick dust from hard surfaces. To-date, the ProTeam ProVac FS 6 receive a lot of great backpack vacuum reviews. Despite its steep price tag, the ProTeam ProVac FS 6 makes perfect sense for serious residential cleaning businesses and professionals looking for a backpack vacuum with impeccable cleaning power and an all-inclusive tool kit. The Sanitaire EURSC412B is a close contender when it comes to the best overall backpack vacuum. Like the Hoover C2401, the Sanitaire EURSC412B is a great mid-ranged option with most of the desired features of a reliable backpack vacuum minus the expensive price tag. Many of its product specifications are comparable to that of the Hoover C2401: good suction power, HEPA filter technology, lightweight design at 11.5lbs and a 50-feet long power cord. One other noteworthy feature would be this backpack vacuum’s 12-inch cleaning path that provides larger coverage when cleaning. The Sanitaire EURSC412B also boasts a decent array of accompanying tools for carpet and bare floor cleaning. This backpack vacuum is slightly pricier than the Hoover C2401. It is also slightly noisier than the Hoover C2401 with a reported decibel level of 69 decibels. Nevertheless, all things considered, the Sanitaire EURSC412B is a great alternative if you are looking for an all-rounder backpack vacuum for home or commercial use in cleaning office areas. ProTeam is renowned for its great commercial vacuum products. The ProTeam Super CoachVac is no exception. It is the most powerful backpack vacuum on my list with a maximum airflow of 159 CFM and a water lift of up to 100 inches. This formidable backpack vacuum is designed specifically for intensive commercial usage to cover high square-footage areas that require constant maintenance. 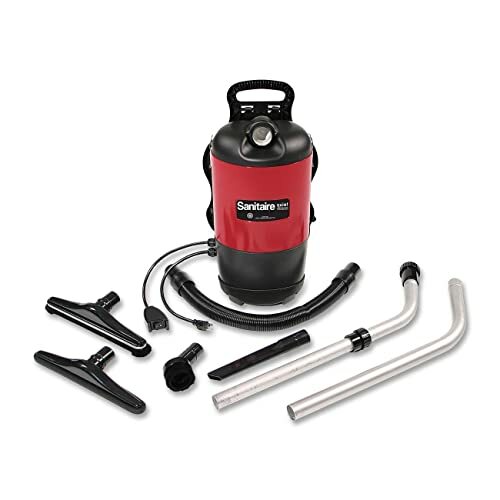 Its 10-quart canister capacity is also the largest among our top backpack vacuum picks. Another noteworthy feature would be the ProTeam Super CoachVac’s ergonomically-friendly design. Its adjustable straps and harnesses conform to the user’s motion. The backpack vacuum borrows its design from mountaineering backpack technology. 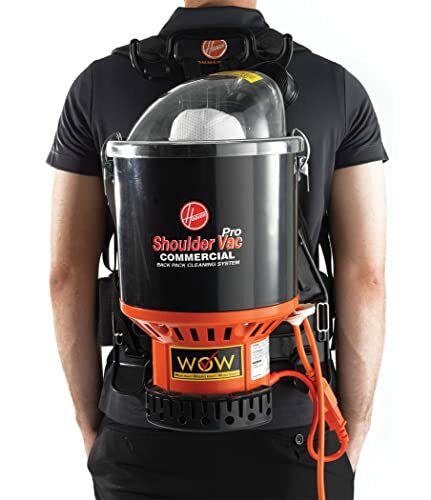 Specifically, the shoulder and waist straps of this backpack vacuum ensure optimal distribution of the vacuum’s weight across the user’s hips. With a 50-feet long power cord, cleaning large areas and several rooms is a breeze when using this backpack vacuum. Of its various toolkit options, the 7-piece commercial toolkit is great for large cleaning areas. One notable tool would be the Xover Floor tool that cleans both low-pile carpets and hard surfaces. The ProTeam Super CoachVac lives up to its expensive price tag. If you are just a homeowner looking for a household vacuum cleaner, this backpack vacuum might be an overkill. For commercial cleaning businesses and professionals, this is a worthy investment. For commercial users, the Atrix VACBP1 is a reasonable choice if price is your main concern. However, it may not live up to your expectations if you want something more durable. The main drawback of this vacuum was that the vacuum motor and other parts would break down or malfunction after one or two years. So, if you are a commercial user looking for a more lasting investment, you may need to consider upping your budget to get a more reliable backpack vacuum. The Atrix VACBP1 tops my list as the most cost-effective solution for home or professional cleaning. 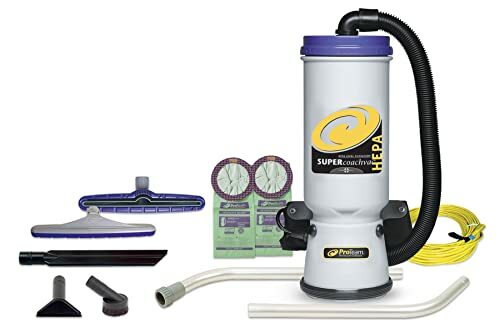 This backpack vacuum is a steal with its whole host of features, tools and accessories, including a 4-stage HEPA filtration system. The Atrix VACBP1 has decent suction power: up to 106 CFM of airflow and 100 inches of water lift. At 10lbs, this backpack vacuum is the second lightest on my list, just 0.8lbs heavier than the Hoover C2401. That said, one significant downside is the backpack vacuum’s dismally short power cord at only two feet. To overcome this, I strongly recommend getting an extension cord so that you can operate the Atrix VACBP1 with relative ease across large spaces. For budget-conscious homeowners looking for an entry-level backpack vacuum, the Atrix VACBP1 is a value buy. 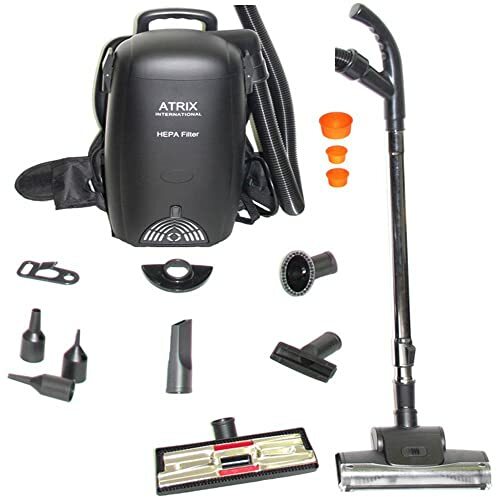 Most homeowners satisfied with the Atrix VACBP1’s powerful suction abilities and had since become backpack vacuum converts after their purchase. To sum it all up, here’s a side-by-side comparison chart to summarize the 5 best backpack vacuum cleaners. How To Find The Best Shark Vacuum﻿ ﻿On Market?